The aftermath of Kristallnacht was devastating: between 1,500 and 3,000 Jews were killed; 30,000 were sent to concentration camps; over 7,000 Jewish businesses were destroyed; and synagogues across Germany were burned down. For many Jews, the attacks of Kristallnacht were a sign that any remaining hope for safety and security in the Third Reich was untenable and they began seeking ways out of Germany. 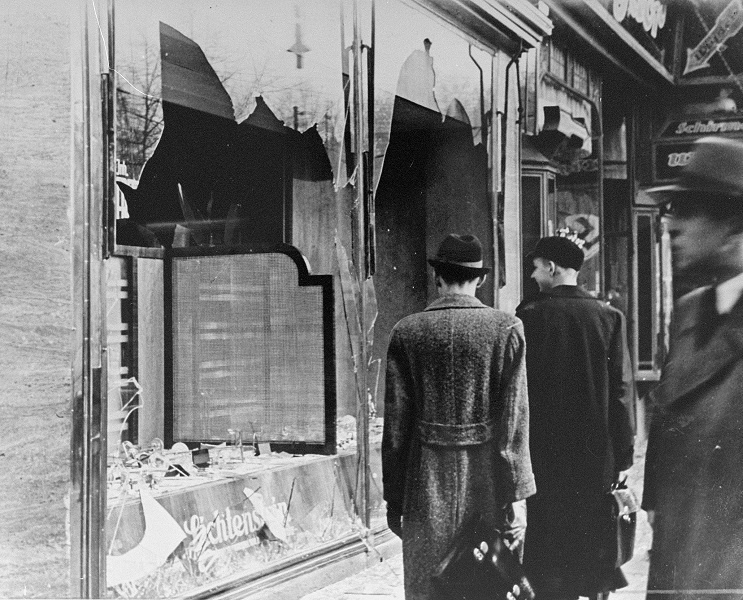 For many non-Jewish people in Germany, Kristallnacht was the first time they were confronted with such a savage outbreak of violence against Jews. Would they try to protect their Jewish neighbors? Would they try to ignore the violence, or even profit from the destruction and confiscation of Jewish homes and property? Remembering Kristallnacht gives us the opportunity to examine the choices individuals made in response to a horrible outbreak of violence towards a minority group. Use these five resources to help students reach a better understanding of Kristallnacht and analyze the choices made by perpetrators, bystanders, and upstanders in a time of crisis. Nazi Telegram with Instructions for Kristallnacht: Examine a translation of a telegram sent from Reinhard Heydrich, Major General of the SS, on November 10, 1938, that instructed local German officers on how to carry the violent attacks. Klaus Langer’s Diary: Read an entry from the diary of Klaus Langer, a 14-year-old Jewish boy in Essen, Germany, describing his experiences during Kristallnacht. Opportunism: Examine firsthand reports of the theft and plunder committed against Jews during the chaos and violence. A Family Responds: Learn about a family who assisted their Jewish neighbors after the attack and the consequences they faced for this decision to help. World Responses: Consider how leaders like US President Franklin Delano Roosevelt, clergy members, and ordinary people around the world responded to the news of Kristallnacht. For these resources and more, explore our chapter, "Open Aggression and World Responses," from our newly revised version of Holocaust and Human Behavior. This chapter examines the growing hostility towards Jews in the years leading up to Kristallnacht as the Nazi regime aggressively tried to rebuild the German military. Photo Caption and Credit: Berlin storefront destroyed during Kristallnacht. United States Holocaust Memorial Museum, courtesy of National Archives and Records Administration, College Park.